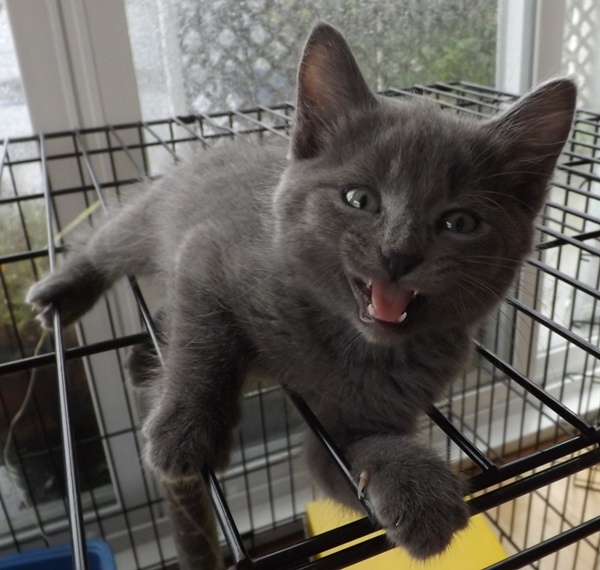 Because we’re among the few Vancouver Orphan Kitten Rescue Association (VOKRA) foster parents willing to take large litters, we ended up with six kittens near the end of summer, 2014. 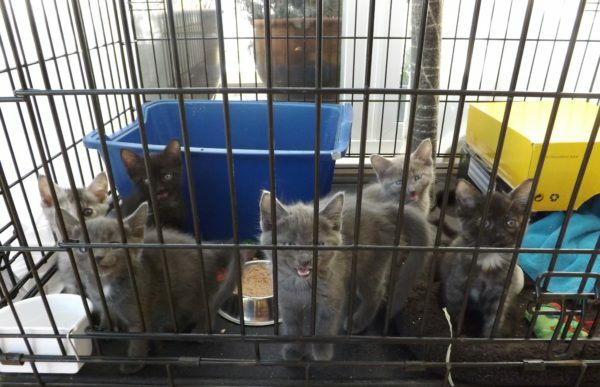 This group was born to a feral mother (whom they stayed with until old enough to be weaned). Momcat was a fierce protector, delivering a nasty bite to one of the VOKRA volunteers, but her kittens were friendly and they loved people right from the start. Momcat looked at us with large, wary eyes as I told her that we would take good care of her kittens (I’m not sure how much gets through to them, but oddly enough, they seem to understand on some level). Momcat went back to live in a feral colony after being spayed, as she was not a cat that could ever adjust to life with people. Some might think that the feral life – life on a cat’s own terms – is superior, but in reality, a life of freedom tends to be nasty, brutish, and short, with the ever-present threats of predators, territorial competitors, and disease. Stray cats often come into people’s homes and attempt to win them over so that they can move in and escape the freedom to starve, be eaten, or die of disease. Managed feral colonies (those for which people provide food and veterinary care) do better, but still not as well as cats in loving homes. When we brought the kittens home, we started them out in a large kitten cage. There are a number of reasons to keep them confined to a large cage or bathroom for the first few days. The confined space helps them learn better litter box habits (if they have a run of the house right away, they tend to choose their own bathroom spots). It also keeps them from becoming overly anxious and hiding, which often happens if they have too much territory initially. In addition, it enables us to keep an eye on health indicators, such as whether or not they’re eating and if they suffer from constipation or diarrhea. Kittens that leave their mothers before 12 weeks of age often suffer from digestive troubles. This litter, although mostly weaned, were still nursing a little. VOKRA wanted to remove them from their mother at around 8 weeks because momcat was trying to teach them to hate people (this would have made them unadoptable, had she succeeded). So they left her before the 12-week mark, which is not ideal. Diarrhea is common in kittens that leave their mothers prior to 12 weeks of age (kittens will normally eat solid food by 8 weeks, but still nurse sporadically for many weeks afterward, and going right to nothing but solid food can upset their digestive systems). We treated this digestive problem in the usual way, by adding a bit of pure canned pumpkin to their food (for more on this remedy, see Using Pumpkin to Treat Diarrhea and Constipation in Cats and Dogs). We named the alpha cat Bif the Mighty. This big gray kitten befriended us immediately and was calm and confident right from the start. Like the others in his litter, Bif was very affectionate. Once he was done playing, he would jump up on my lap, climb my clothing, and kiss my nose over and over again, making it impossible to get any work done. 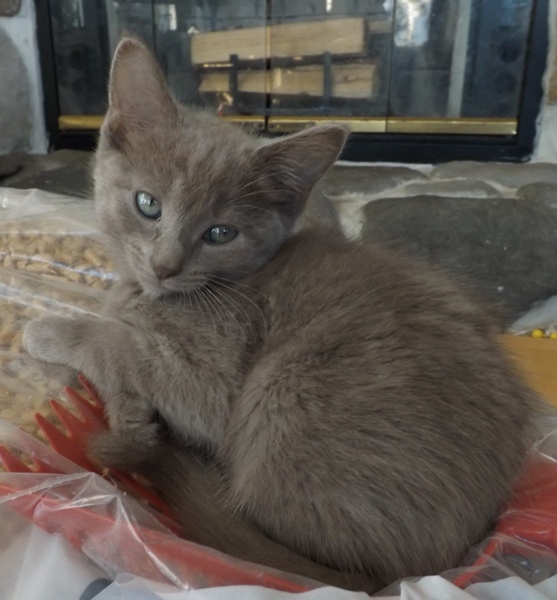 The pale, silvery gray kitten got stuck with the name Sir Ashington Bigglesworth the Fourth, though we called him Ash for short (repeated names create problems within the VOKRA database, so we have to come up with increasingly outlandish monikers to avoid redundancy). Ash was unusually beautiful and very quiet. It took him quite a while to make some noise. He meowed frequently, but no sound came out until he developed some self-confidence. When he did eventually speak, he had a little meow, nothing like Bif’s assertive trill. Ash was an undemanding kitten who loved tummy rubs. He would roll over on his back and look up hopefully, but never ask for anything in a more direct way. 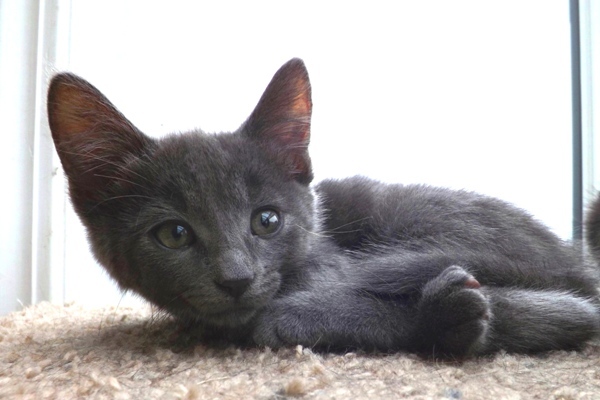 Javabean was a dark gray kitten with a slender, Siamese-style build, lots of energy, and facial features that made him look perpetually serious and thoughtful. Like his littermates, he was a cuddly, gentle little guy who loved to be held. He was also quite bright and inquisitive, and like his siblings, learned his name within 24 hours and came when called. Samurai Warrior was a black kitten with tabby ghosting (stripy markings in a lighter colour that usually disappear as the cat matures). He had the coolest moves when practicing his fighting skills, and the loudest purr when held. Like all the black cats we’ve fostered, he was unusually intelligent (sadly, many people avoid adopting black cats, LINK yet they tend to be the most healthy, bright, and sweet-tempered). Magma (Maggie), named in honour of our recent hike to the top of the Mount St. Helens volcano, was a pretty little tortoiseshell kitten with a plush, silky coat. Like her siblings, she had impeccable grooming habits and kept herself spotless (foster kittens who leave their mothers before 12 weeks of age tend to be quite messy and need help cleaning themselves properly; luckily, these guys were the exception to this rule). Although playful, Maggie was a sweet, undemanding kitten who never had to be asked to get off the table or stop chewing the plants. 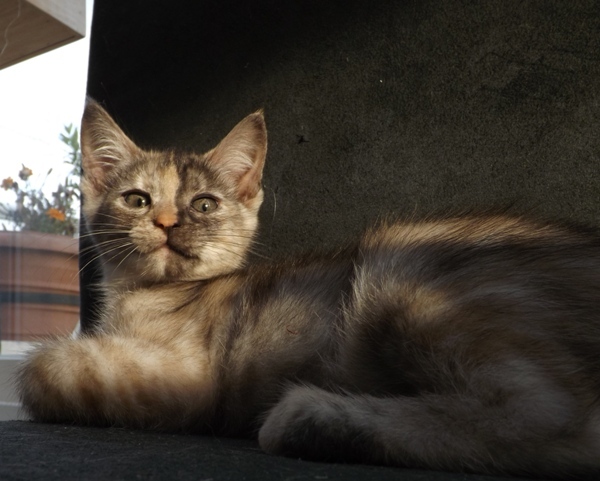 Callispell was a Torbie (a tortoiseshell with some tabby markings). She had an unusual colour pattern that divided her face in half so that she looked like two different cats that had been stitched together. Calli was less mature and still quite attached to her mother at the time of separation, so she had the greatest difficulty adjusting. She clung to us in a panicky way when we first brought her home and tended to be anxious. I made a little kitten house out of a shoebox for her to hide in when she first arrived, though she quickly gained confidence and emerged from her refuge to run around the livingroom with her siblings. Once she had vacated the kitten house, our large resident cat Sage attempted to take it over, but it was far too small for him and he got his head stuck in the little doorway and destroyed the kitten house quite thoroughly within 10 minutes. Like the other foster kittens we’ve cared for, these guys loved our resident cats. 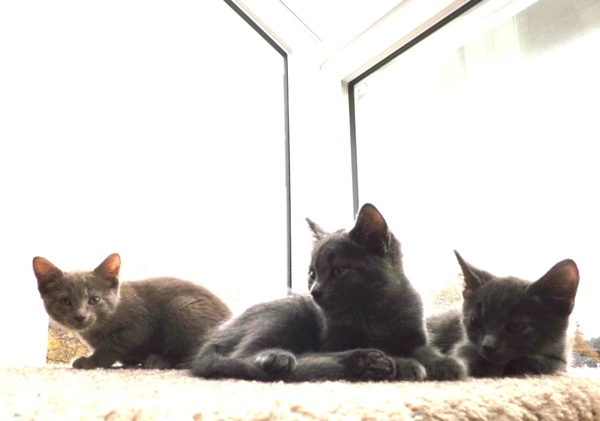 The three residents are remarkably tolerant, and they often help out with the caretaking duties, teaching the kittens important skills such as grooming and appropriate litter box habits, as well as general feline etiquette, and helping us keep them clean. 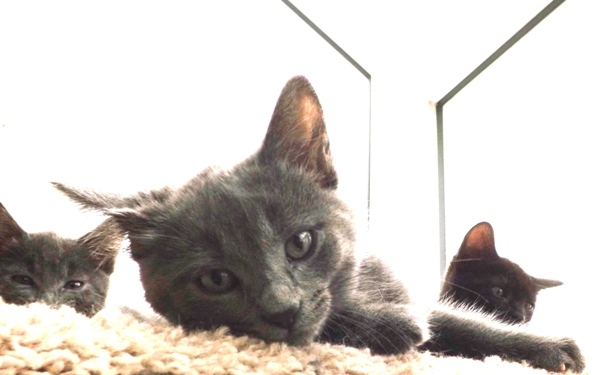 The kittens were adopted out in pairs, Bif and Ash, Java and Samurai, and Maggie and Calli, and we’ve received updates to let us know that they’ve settled in well to their new homes. Resident cat Freya took the time to examine each of the adopters quite thoroughly before giving her approval, so I had no concerns. With the long, hot summer we had this year, the birthrate for late summer kittens was unusually high, so we’ll likely end up with another litter before Christmas. 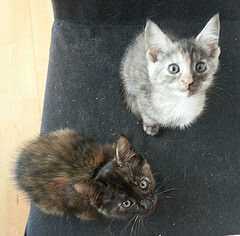 For more foster kitten stories, see the main Foster Kittens Photo Diary page. 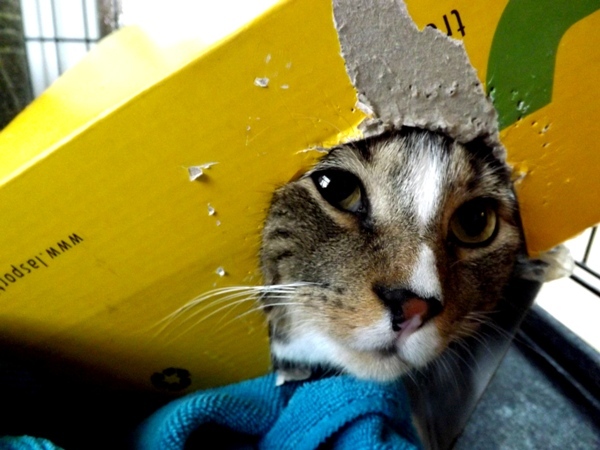 For a full list of cat articles, see the main Cats page.